2. OVERVIEW OF INSTRUMENTATION PROBLEMS. Differences between terrestrial and Martian dust devil pressure excursion measurements hinge largely on the accuracy of the 354-gram Tavis magnetic reluctance diaphragm used for Vikings in 1976, and Pathfinder in 1996; and a 26-gram Vaisala Barocap ® sensor developed in 2008 by the Finnish Meteorological Institute (FMI) for the Phoenix and MSL Curiosity. Did any probes sent to Mars ever have the ability to measure pressures near those associated with terrestrial dust devils? The answer appears to be “no.” However, as will be discussed later in conjunction with Figure 10B, Tavis CAD 10484 indicates that one of two transducers ordered for Pathfinder had a pressure range of 0 to 15 PSIA. This means it could measure up to 1,034 mbar. Supposedly that sensor was not sent. Two variable reluctance type pressure sensors with a full range of 1.79 x 103 N/M2 (18 mb) were evaluated to determine their performance characteristics related to Viking Mission environment levels. Twelve static calibrations were performed throughout the evaluation over the full range of the sensors using two point contact manometer standards. From the beginning of the evaluation to the end of the evaluation, the zero shift in the two sensors was within 0.5 percent and the sensitivity shift was 0.05 percent. The maximum thermal zero coefficient exhibited by the sensors was 0.032% over the temperature range of -28.89°C to 71.11°C. It gets a lot colder than -28.89°C on Mars, but Professor Tillman insisted that “The pressure sensors were located inside the lander body and heated by RTG (radioisotope thermoelectric generator) units. They were not exposed to ambient Martian temperatures.” This report will question whether rapid ingestion of dust during the landing process also prevented transducers from ever correctly measuring ambient Martian pressures. Figure 5A is the very first picture ever transmitted from the surface of Mars to Earth. It was taken between 25 seconds and 4 minutes after the landing and it makes clear that dust was an immediate issue when the landing occurred. Figure 5A also shows that rocks were also kicked up and landed on at least one footpad. Figure 5B shows that again with the MSL landing rocks kicked up on landing fell on the lander deck. As is shown later in this paper on Figure 50E, dust covered a camera lens cover on the MSL too. So it’s a safe bet that dust could have quickly made its way into the MSL’s Vaisala pressure transducer’s dust filter. FIGURE 5A ABOVE: Viking 1 footpad with dust, sand and rocks on it right after landing. Effects of dust cloud stirred up are to the left. For a better view, see the NASA image at http://upload.wikimedia.org/wikipedia/commons/a/ae/Mars_Viking_12a001.png. 2.1 Vikings, MSL, and Gay-Lussac’s Law. RTGs may be at the root of problems with Viking and MSL pressure readings which appear to vary inversely with outside temperatures. That is, when it gets colder outside and RTGs need to warm the inside of the landers, the pressure recorded inside goes up. Temperature and pressure variations seen for Viking 1 Year 1 almost exactly match what would be expected in accordance with Gay-Lussac’s Pressure Law (see Figures 6 through 9C). To counteract a minimum Year 1 temperature of 177.19K seen, and to raise internal temperatures to the maximum Year 1 external temperature seen (255.77 K), air caught behind a dust clog would experience a pressure rise. If Viking 1 sucked in enough dust and sand on landing to clog, but not enough to equalize the internal pressure with the air pressure outside, then whatever Year 1 minimum pressure seen inside the lander at the Tavis pressure transducer (6.51 mbar) would increase in pressure in accordance with Gay-Lussac’s Law. As is shown on Figure 6, when the above two temperatures and 6.51 mbar are entered into the calculator, the expected pressure is shown to be 9.397 mbar. The actual maximum pressure recorded by Viking 1 was 9.57 mbar. That is a 98.19% agreement with the idea that the air access tube for the sensor was clogged. For Viking 2, the minimum and maximum temperatures were 152.14 K and 245.74 K. The minimum pressure found was 7.29 mbar. The maximum predicted pressure was 11.775 mbar. The maximum pressure recorded by VL-2 was 10.72 mbar, which is 91.04% of the predicted value. See Figure 6. The data points on Figure 6 are meant to get some sense of whether the pressure limits seen were roughly in line with expectations based on heat applied to a sealed space (behind the dust clots). They were, but obviously more so in Viking 1’s first year. By Year 2 overall predictions were off by 9 or 10 percent, but the calculations are less certain because of many incidents involving stuck pressure readings, sometimes for days on end. Annex C of this report supports this allegation, but Annex D also highlights stuck pressure readings for Viking 1. The old cliché “Garbage in Garbage out” sums up the problem. Temperature data seemed credible for the Vikings (except when reported as Absolute Zero). However temperatures (in particular, ground temperatures) were problematic for MSL as is detailed in Section 14.1 of this report. We assert that pressure data was not credible for any lander. When comparing maximum air temperatures seen at MSL and Viking 1, we show in Annex M to this report that the highest air temperature seen after JPL revised it year 1 data was 4º C (274.15K). MSL sits at 4.59 º South on Mars at an altitude of 4,400 meters below areoid. Viking 1 was also in the tropics at 22 º North. However VL-1 was at an altitude of 3,627 meters below altitude. R.M. Haberle111 at NASA Ames claims that the adiabatic lapse rate for Mars is about 2.5K km-1. Using that rate we would expect the maximum temperature at VL-1 to be about 1.9325 K lower than at MSL however the maximum temperature at VL-1 was only 255.77K, while the maximum (revised) temperature for MSL Year 1(on MSL Sol 227/March 2, 2013) was 274.15K, a full 18.38 K warmer than at VL-1. Further, before JPL revised its MSL temperatures it indicated a maximum air temperature at MSL of 8º C (281.15 K) on MSL Sol 102 (November 18, 2012) but they later altered this temperature to -3º C (270.15 K). The high for MSL Year 2 was 11º C (284.15K) on Sol 760. So, it would appear that there is room to question the accuracy and consistency of air temperature sensors on these two missions. 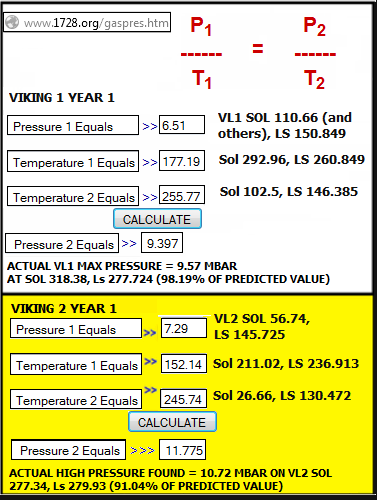 Figure 6 Below: Pressure calculator with entering arguments based on Vikings 1 and 2 Year 1 results. Prediction is 98.19% in agreement with measured results for Viking1, 91.04% in agreement for Viking 2. Annex D displays our attempt to predict pressure on what is basically an hourly frequency (actually once per time-bin, with each time-bin equal to about 59 minutes) for Viking 1 sols 1 to 116 and 134 to 350. While previous researchers focused on diurnal pressure cycles, Annex D focuses on the percent differences between pressures measured and pressures predicted based on heat being applied by RTGs when temperatures fell. There was a distinct pattern seen, often as clear as what one would see when looking at a healthy electrocardiogram. Pressures would vary – sometimes by up to 26% from the predicted value, and then settle back to almost 0 percent difference, always at the same time of day for long periods of time. Annex D is voluminous, providing all temperature and pressure data available for Viking 1. Each page has the 25 time bins for one sol on the left side and for another sol on the right. Appendix 1 to Annex D has data for VL-1 sols 1 to 91 on the left; and sols 92 to 116 plus 134 to 199 on the right. Appendix 2 to Annex D has data for VL-1 sols1 to 200 to 274 on the left, then for sols 275 to 350 on the right. When the percent difference is less than 2%, the data is shown in red bold fonts. Annex E just singles out the percent differences seen for the .3 and .34 time bins over VL-1 sols 200 to 350. This (generally around sunrise time) is one of the times when it would be reasonable to expect heat from the RTGs to access equipment (like cameras) that need to begin their daily operations. The average percent difference was 2.67%. Of the 302 pressure predictions made, 72 had a percent difference of less than 2%. See Table 2 and Figure 8 for further details. Table 2 above: Viking 1 cyclic accuracies for pressure predictions. See Figure 7 and Annex F for further details. The data source was the Viking Project site at http://www-k12.atmos.washington.edu/k12/resources/mars_data-information/data.html. Figure 7: Viking 1 cyclic accuracies for pressure predictions. See Annex F for further details. The data source was the Viking Project site at http://www-k12.atmos.washington.edu/k12/resources/mars_data-information/data.html. Annex F focuses just on time-bins that have a percent difference between measured and predicted pressures that is under 2%. It makes clear that gradually the time of the greatest percent difference agreement would shift by a time-bin. For example, there is a better than 2% difference agreement at the 0.3 time-bins starting at VL-1 Sol 211 continuing until VL-1 sol 288, a 78-day run. The agreement was at the next later time-bin (0.34) for sols 205 to 210 just before the long run, and the agreement switches back and forth between these two time bins until sol 299. Then the agreement moves the 0.38 time bin as Viking 1 experiences the first day of winter at its Sol 306. There is a similar run of small percent differences in the middle of the night. For example, in the 0.1 time-bin between Sols 255 and 350, there were only nine times that the percent difference was 2% or more. Likewise, the percent difference was (except for once) always under 2% in at least one of the two time-bins labeled as 0.66 and 0.7 (early evening) between sols 200 and 240. Where pressures drift away from the 2% standard, it is believed that the RTGs were not permitted to transfer heat to the transducers and heat was slowly lost to the frigid outside. Figure 8 is a sample of Annex F (sols 228 to 250). Figure 8 Below � Sample of Annex F showing the times of day (for sols 228 through 250) when pressure predictions had less than a 2% difference from measured pressures at Viking 1. The formula used assumes that the pressure transducer is no longer in contact with the ambient atmosphere on Mars. 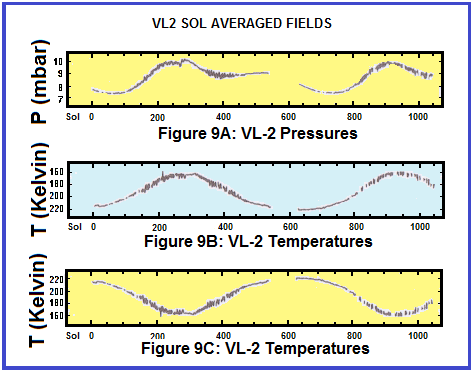 Most striking is what happens in a close examination of graphs that sum up Viking-2 sol averaged temperatures and pressures. Figure 9A and 9C show that as temperatures fell, often pressures rose. To counter falling temperatures, RTG heat is allowed to access the lander interior to maintain temperature stability there. As this occurs, air trapped behind any dust clot would experience a pressure increase. When the Figure 9C graph is inverted and displayed as Figure 9B, the temperature and pressure graphs are nearly an exact match. The biggest discrepancy is after a hiatus with no data between Viking 2 sols 560 to 633 (Ls 68 to 100 in Martian spring to summer). VL-2 pressure readings were often stuck for 10 hours to six days (see Annex C for VL-2 sols 639-799). When pressures were stuck, temperatures were not. Figure 9A through 9C Below: Graphs shown on 9A and 9C are redrawn from Tillman and Johnson. Figure 9B inverts the direction of temperatures on the Y axis to show how heating by RTG s to counter increasing cold outside produces a curve very similar to the pressure curve. THIS REPORT IS CONTINUED AT SECTION 2.2.